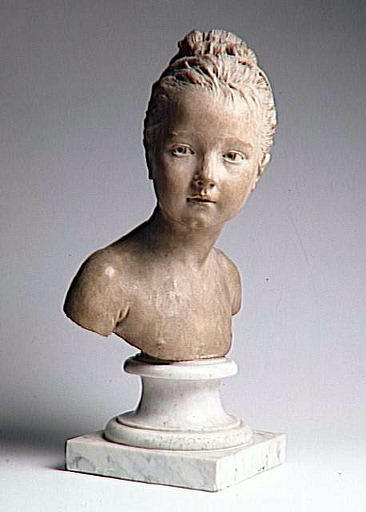 A Very Fine French 19th Century Terra-Cotta Bust of and Infant Louise Brongniart after Jean-Antoine Houdon (French 1741-1828) raised on a later Blue Turquin marble plinth. Circa: Paris, 1880. Among the numerous busts Houdon showed at the Salon of 1777 were a pair of Louise Brongniart and her brother Alexandre, both children of the distinguished Neoclassical architect Alexandre-Théodore Brongniart (1739–1813). The originals, now believed to be the terracottas in the Louvre, were among the sculptor's most popular creations and that of the five-year-old Louise, in particular, was reproduced well into the twentieth century. The Metropolitan Museum's marble, with a kerchief headdress elaborating the knotted scarf that binds Louise's hairdo in the original, is now thought to be one of numerous later variants. Also unique to this example is the ruffled fichu that emphasizes the little girl's simply truncated exposed chest. A version of this model, also in terracotta is currently on display at The Louvre in Paris. A variant version of this model after Houdon is currently on dislplay at The Metropolitan Museum of Art in New York.